While it looks unconventional to modern eyes used to the Remington 870 and Mossberg 500, the Winchester 1897 shotgun was once one of the most popular shotguns in the country. Produced from 1897 to 1957, the Winchester 1897 was the first commercially successful pump shotgun and one of the first shotguns built to withstand the pressures of smokeless powder shotshells. Over one million Model 1897s were produced over the course of its production run. 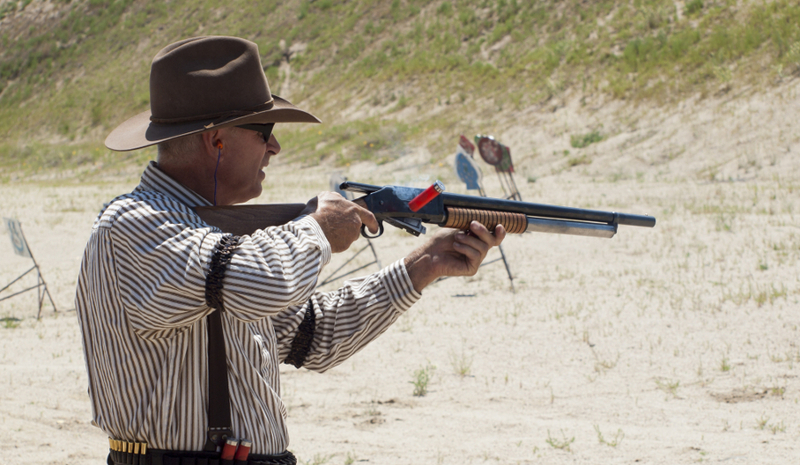 While its external hammer looks were quickly superseded by the smooth receivers of modern pump action shotguns such as the Winchester Model 12 and Remington Model 31, the popularity of Cowboy Action Shooting and modern reproductions of the Winchester 1897 have brought a renewed interest in the old scatterguns. The Model 1897 was an improvement on the Model 1893, both guns being designed by John Moses Browning. Available in both 12-gauge and 16-gauge, the Model 1897 was popular with American troops in World War I, seeing service both in clearing trenches and in detonating hand-thrown grenades before they could reach entrenched troops. Like many other older shotgun designs, the Model 1897 lacked a disconnector, allowing troops to depress the trigger and shoot the five rounds in the magazine solely by racking the slide. The 1897 was also one of the first shotguns to introduce a take-down feature, allowing the barrel to be removed from the receiver to shorten the gun for transportation. While that’s expected to be standard on pump shotguns today, at the time it was quite innovative. Some original 1897 shotguns can still be found at relatively reasonable prices, thanks to low demand for external hammer shotguns. Condition won’t be great on those guns, but they’ll be perfectly serviceable. Newer reproductions of the 1897 from manufacturers such as Norinco can often be found for $200-250, about the price of a contemporary pump shotgun. Winchester 1897s have seen a lot of use over the years, from trap fields to trenches. They’ve earned a reputation for rock solid reliability and the ability to shoot tens of thousands of rounds with little maintenance required. As the first successful pump action shotgun, the 1897’s operation is somewhat different from modern pump shotguns. In order for the action to be opened when the gun is cocked, the slide must be moved slightly forward first. Normally that is accomplished through recoil. Dry firing is a bit different, and will take some getting used to. The external hammer on the Model 1897 can potentially snag on clothing, brush, etc., making it less than ideal for home defense or hunting. And the sight of the bolt coming out the back of the receiver could be a little disconcerting for those used to modern shotgun receivers. As long as parts are available, the Winchester 1897 will be relatively easy to service. But having been out of production for over 60 years, even with new clones being produced it’s unknown just how long parts are likely to be available.